Like we saw just a week ago with Hurricane Gordon, prices are rising in the lead up to Hurricane Florence’s landfall. 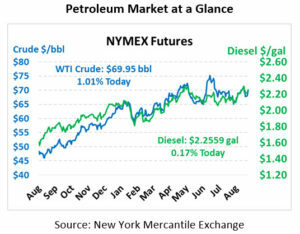 Traders often buy up fuel contracts leading up to an event amid pre-crisis demand spikes and uncertainty on national fueling impacts. The Carolinas have no major refineries or production areas, so it appears traders are betting on some type of impact to the Colonial Pipeline – likely confined to small delays from power outages, but possibly including large disruptions due to flooding. 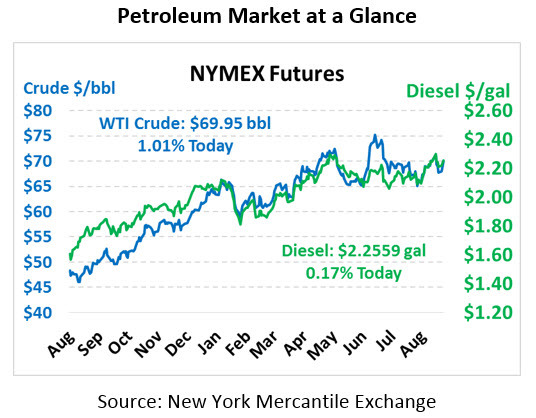 After gaining nearly $1.75 yesterday, crude prices are sustaining their rally this morning. Adding to hurricane concerns was a bullish inventory report from the API and geopolitical chatter elsewhere in the world. Crude is currently trading at $69.95, gaining 70 cents since yesterday’s close. Fuel prices are also moving higher in conjunction with crude, with gasoline breaking above the $2.00/gal mark yesterday while diesel surpassed $2.25/gal. This morning, gasoline is trading at $2.0222, picking up 0.8 cents. Diesel prices are trading at $2.2559, up 0.4 cents since yesterday. The API released their weekly inventory forecast, and the results showed a huge draw in crude, combined with large builds in fuel stocks. Because the overall oil complex was down, traders are interpreting the results as bullish for prices. The EIA will release their weekly data later this morning. Around the world, geopolitical tensions are rising following a shooting in Libya at the National Oil Company. Libya’s production has been faulty over the past year, quickly zipping higher and lower during crises. Given the timing, any disruption in Libya’s oil supplies could add to the supply tightness caused by Iran sanctions. Libya’s NOC has noted they will continue business as usual after the shooting. Yesterday the EIA released their monthly STEO report, which highlighted a $3/bbl increase in crude price forecasts in 2019, up to $67/bbl for WTI crude. The EIA tends to take a conservative approach to fuel prices based on extrapolations from the forward curve and overall supply/demand, rather than accounting for various financial and geopolitical impacts. The organization slightly reduced its expectations for supply/demand balance, from 0.2 MMbpd oversupplied in 2019 to just 0.1 MMbpd, largely due to reductions in US crude production. On another topic, the EIA noted an uptick in hedging activity as consumers try to avoid the fuel price impact of Iran sanctions. Trading levels have increased as countries are reducing purchases of Iran’s crude, and the EIA estimates Iran exports are down 19% compared to the first half of 2018. The expected increase in crude prices following sanctions are causing some to buy hedging instruments to keep their fuel prices lower.